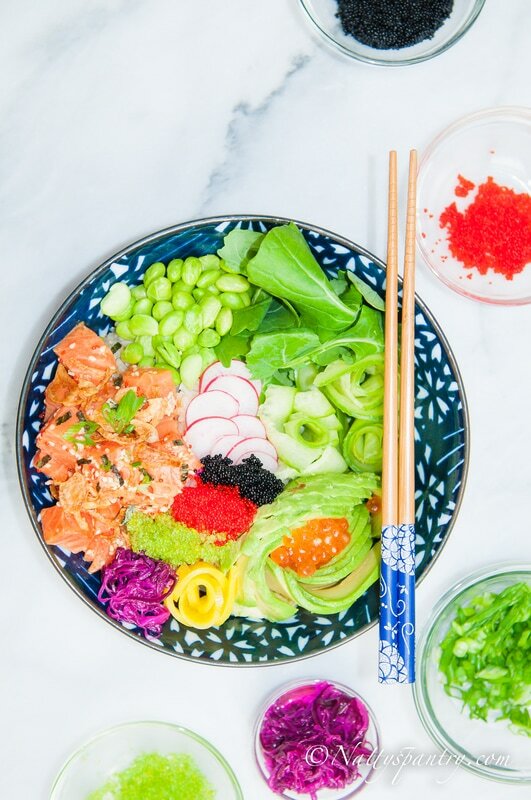 When the weather starts getting a little warmer, I start thinking about a healthy Poke Bowl. I fell in love with the Poke Bowl when I tried them for my first time last summer. There are a few Poke Bowl places in Chicago: Aloha Poke Co, and Fire Fin Poké Shop. They both offer a variety of Poke Bowls on the menu. 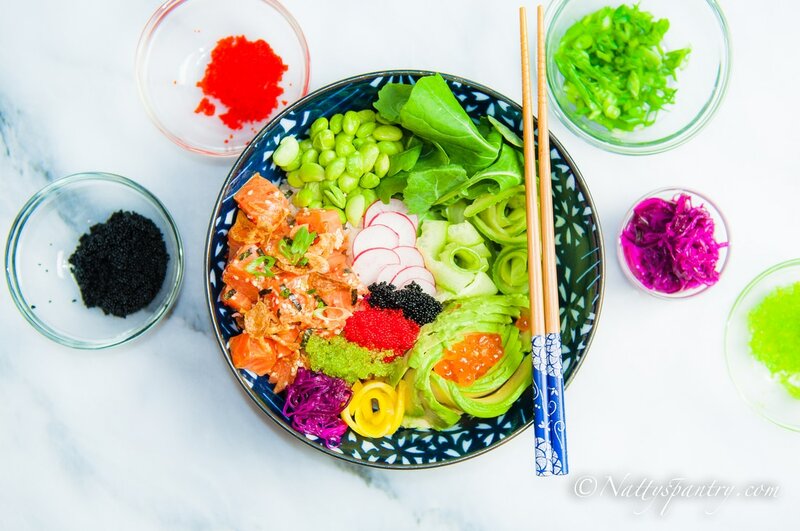 Did you know you can easily create a fresh and delicious Poke Bowl at home? You can also adjust the taste to either more spicy, sour, or sweet. I am so lucky to live in the city of Chicago where we have a few great high-quality Asian grocery stores. 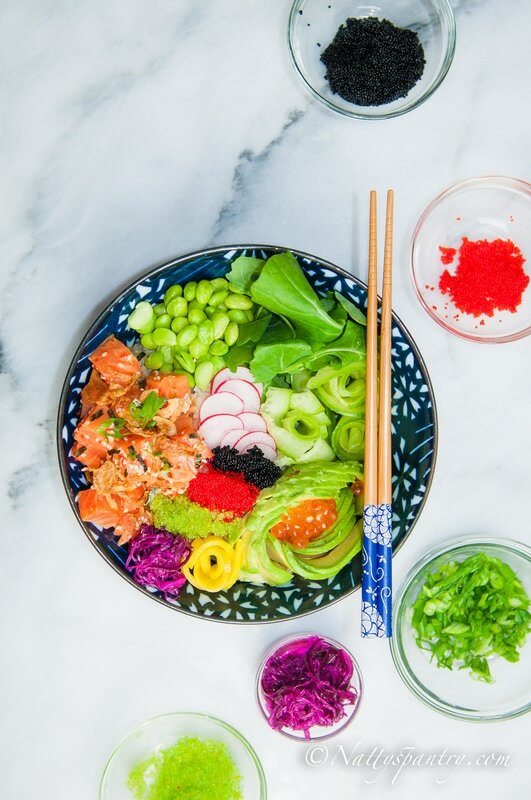 And when it comes to sushi or a poke bowl, you have to make sure that you can eat them raw. Check an Asian market near you to see if they carry sushi grade fish as well- you might find more of an assortment of fish there such as Yellowtail, Tuna, or Salmon. 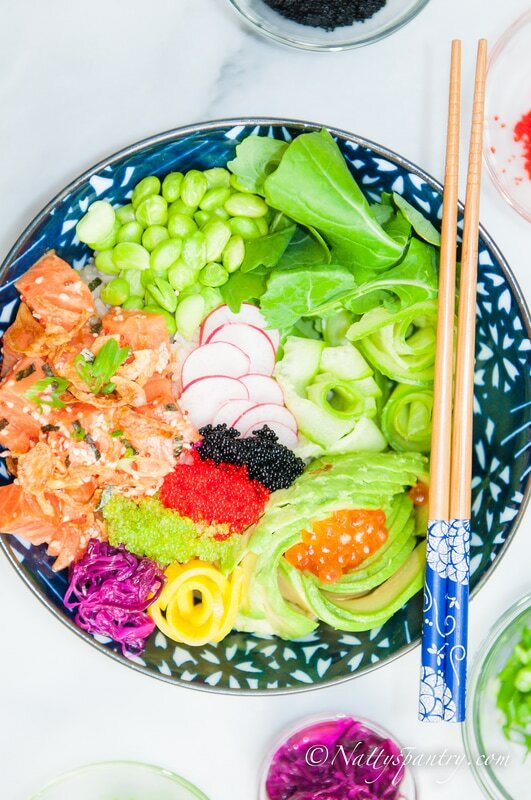 My Poke Bowl is loaded up with all kind of pickles, edamame, fresh mixed greens, avocado, cucumber, Ikura, radish, and a variety of Tobiko. You can also create your own style by adding your favorite vegetables and pickles. 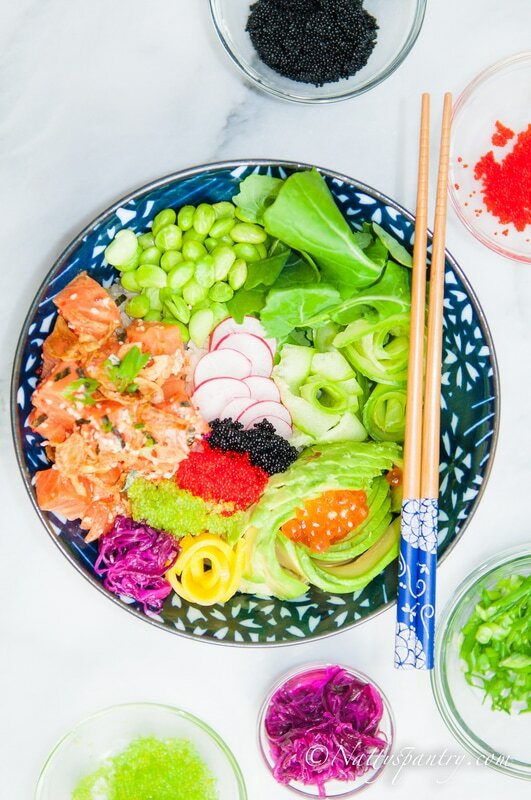 This is such a fun idea for hosting a party too as it allows everyone to pick their favorite toppings to create their own colorful Poke Bowls. How fun is that!?! - Please be sure to ask the vendors ”Is that safe to eat raw?”. - Tobiko- if you can't find it, it's not essential to the dish. - Ikura is a red caviar made from the roe of Pacific, Atlantic and river species of Salmon. It adds a great flavor into the bowl but if you can't find, you can leave them out. - Many grocery stores sell seaweed salad. If you can't find it, you can leave it out. Prepare the salmon: Clean the salmon with cold water, and dry it with the paper towel. Slice into cubes and set aside. In a small bowl add the soy sauce, brown rice vinegar, toasted sesame oil, mirin, toasted sesame seeds, red Tobiko, Agave, garlic, and ginger. Mix all together until it is well combined. Add the salmon into the bowl and gently mix all ingredients together. Make sure the salmon is evenly coated with the marinade sauce.